Versa-Cut 40 Plasma Cutter easily slices through materials up to 3/8" thick. The Eastwood-designed plasma cutter is your smartest choice for making clean, fast cuts through steel, stainless steel or aluminum as thin as 24 gauge or as thick as 3/8-inch. Compared to mechanical cutting, our Versa Cut 40 Plasma Cutter works significantly faster and makes curved and intricate cuts more easily and precisely. This is our best all-around plasma cutter and will handle most auto restoration, fabrication or repair work. The power, portability and affordability make it an essential tool for those who need to quickly slice through metal parts. This innovative, affordable, plasma cutter was designed and developed by Eastwood's own R&D staff and tested in-house on the same type of real-life projects you'll use it for. It doesn't matter where you need to work, because this plasma cutter's voltage-sensing technology lets you use either a 110v or 220v outlet with our adapter cord. It can cut through 1/8-thick metal on 110v power, enough for thin-gauge sheet metal and light fabrication. This portable plasma cutter is lightweight as well, weighing just 36 pounds so you can easily bring it along or plug it into a generator. Inverter technology offers superior arc stability and plasma cutting power. A built-in pilot arc system allows for instant arc striking and ease of use when cutting rusty material and expanded metal. The internal moisture separator helps to ensure clean dry air gets to the torch to give you consistent results. With a duty cycle of 60 percent, this plasma cutter will cut at 40 amps for up to six minutes before it needs to cool. It also requires just 5 to 7 cfm of air at 60 psi, which can be supplied by common shop compressors. You can easily adjust the amperage and air pressure using the dials. Plasma cutting tools utilize a high-velocity jet of ionized gas (plasma) that conducts electricity from the torch of the plasma cutter to your metal workpiece. That directed plasma stream (about 30,000 degrees F) heats the work piece, converting the metal to molten slag. That high-velocity stream literally blows the molten metal away, leaving clean, precisely cut metal. With a 40-amp plasma cutter, you can do more in your body shop or race car garage. The Versa Cut 40 Plasma Cutter comes with Trafimet CB50 torch and 20-foot cable plus a 10-foot ground clamp assembly for safely getting around your work. 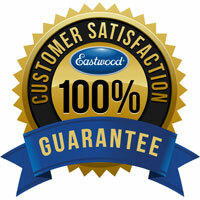 It comes with our 100 percent customer satisfaction guarantee and free tech support by phone, email or the Eastwood Garage. If you're a first-time plasma cutter user, check our accessory buyer's guide to see what else you'll need for safety and performance. Our Versa-Cut Plasma Cutter is supplied with the popular NEMA 50P plug, requiring a NEMA 50R receptacle. Always wear approved eye protection and gloves. Do not use around flammable materials. Do not open machine. There are no user-serviceable parts. Get this portable Plasma Cutter PLUS our MIG 175 Welder and SAVE BIG!Click here to see our money-saving Versa Cut 40 Plasma Cutter and MIG175 Kit! Get this Plasma Cutter PLUS our MIG 135 Welder and SAVE BIG!Click here to see our money-saving Versa Cut Plasma Cutter and MIG135 Kit! 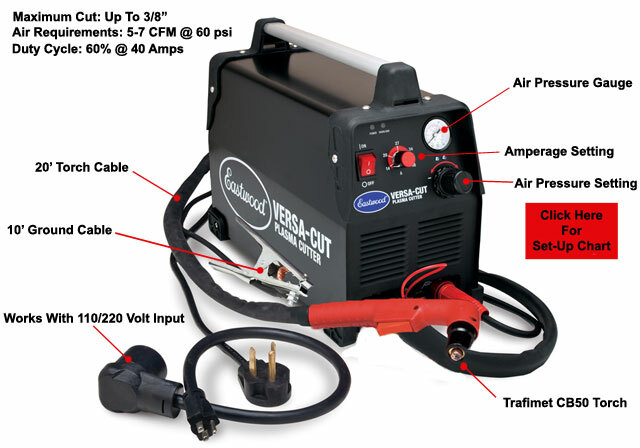 Get this Plasma Cutter PLUS our TIG 200 Welder and SAVE BIG!Click here to see our money-saving Versa Cut Plasma Cutter and TIG 200 Welder Kit! 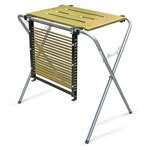 Convert your Fender Stand into a welding table or plasma table!